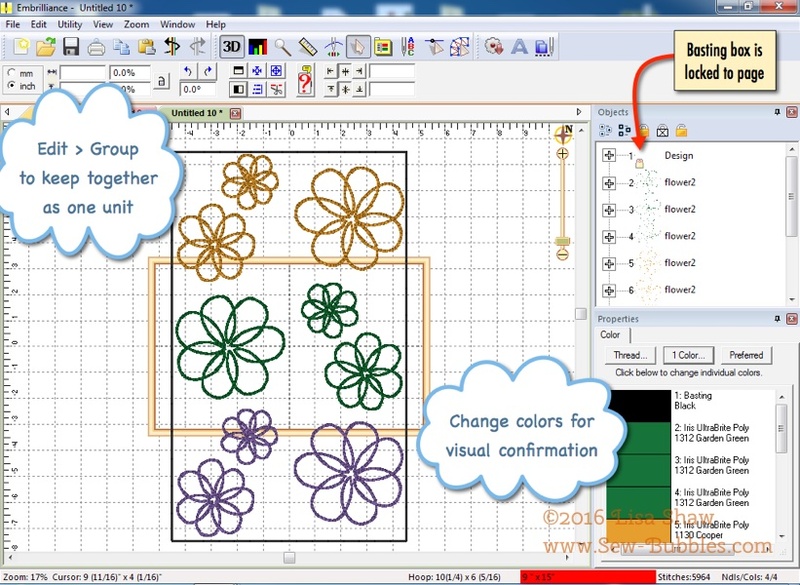 Creating an all-over embroidery design for fabric is an easy way to create a completely custom piece. I LOVE the shape of the Lazy Girl Designs Bendy bag. When I first saw preview pictures – my imagination went into high gear thinking of all the possibilities for embroidery because that’s what I do. I love to sew, but my main focus is machine embroidery. SO in order to get the best of both worlds, I like to find project to sew that allow me to create a canvas for machine embroidery embellishment. And that is why I am a HUGE fan of Lazy Girl Design patterns – they are not overly complicated but always have some interesting focal point. So when I saw the Bendy Bag – I knew it would be a great pattern to use an all-over embroidered fabric – and then when I saw that Joan was teaching a class on Craftsy that included the Bendy bag PLUS 2 others – well that was a complete bargain. You will learn SEW MANY time saving techniques in addition to easy zipper installation in her class. Shhh don’t tell anyone but I’ve watched this class more than once and learn a new professional technique each time. And if you’d like a discount, use this link! For those of you that know me, I teach the Craftsy classes – Big Embroidery with a Small Hoop and Hoop Savvy. (click here for a 1/2 price coupon). In Big Embroidery with a Small Hoop, I share with you my tips and techniques for stitching and lining up large designs so that you too will no longer have any fear of “taking the fabric out of the hoop” for a rehooping project. 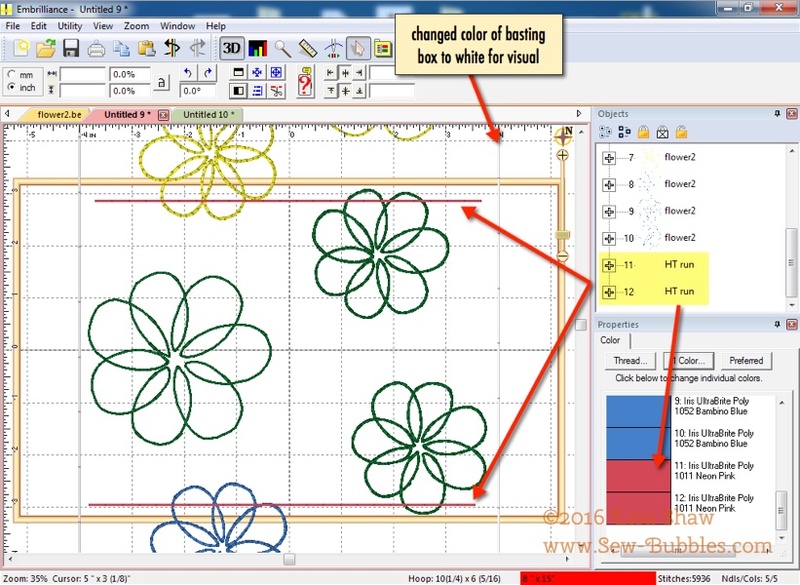 This blog post is going to give you some software pointers and ideas on how to create a large all-over embroidery layout and then break it up into pieces that fit your hoop. If this is your first time experimenting with this – AWESOME! Just to let you know – the Bendy pattern construction is SO FORGIVING if you happen to “oops” on the lining up so relax and don’t stress. Honest – I would say this project is probably one of the BEST to try this new technique on – and once you make the Bendy bag you will understand why and show off your accomplishment proudly! So, first I use Embrilliance software. What’s nice about Embrilliance is that it will run natively on EITHER a Mac or Windows computer – and looks the same in either OS! So even though I will show you screenshots from the Windows version, the steps are exactly the same in the Mac version. I normally run the Mac version but I have to keep my skills up in both operating systems (YES I do forget how to use Windows if I don’t use it!) so today we will be on Windows. 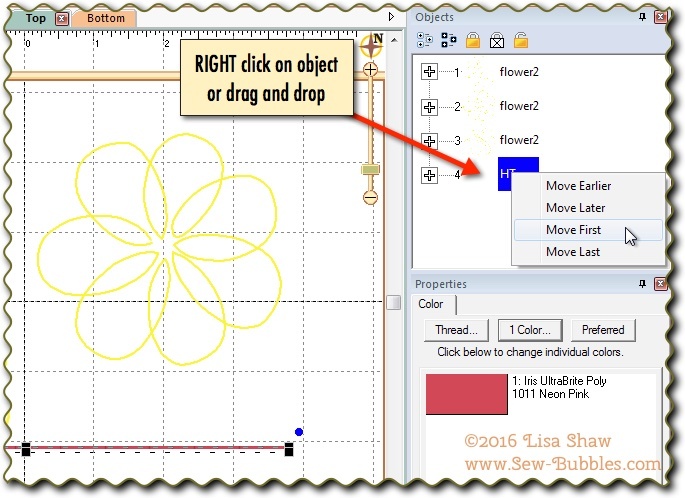 That being said – the information I present should be able to be applied to any embroidery software program, not just Embrilliance – you just need to know what buttons to push in your program to get the same results. The first thing I will do for this project is to choose my hoop that I will be using to stitch the design, and then create a large layout. 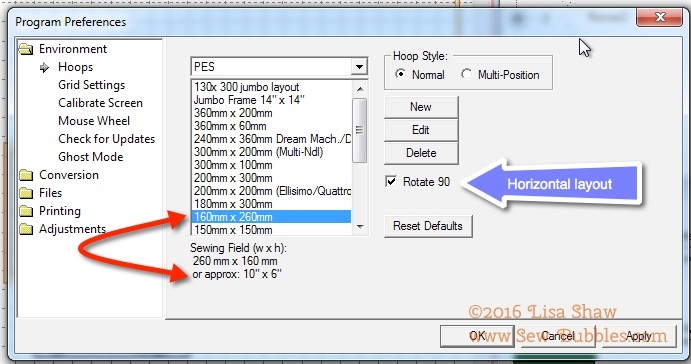 This is done in the Preferences dialog where you choose your format from the top menu and select your hoop from the list. Notice that when you select a hoop in metric (metric is accurate and exact) the approximate familiar inch size is listed below. I plan to use my 6×10 hoop so this is what I will select to be my guide in the layout. Now we will use the File > Merge Stitch file to select the design that we want to use in this layout. Embrilliance opens and saves to all the home machine formats plus DST and EXP which are used by most commercial machines. So we have one design open, the next thing we want to do is create a “fabric layout” so that we know how big we want our all-over embroidered area to be. For this project the embroidered area will be about 9” x 15” and we will cut it down to fit the pattern after it has been embroidered. I added a bit of a margin to the cutting size to accommodate any change and you will cut down to the actual size when complete. So, the first thing we are going to do is add a basting box – we aren’t stitching this, it is just going to show us where we want the embroidery to go. The basting box will be the size of the all-over embroidered finished piece. We go to Utility > Baste Design and this adds a running stitch basting box around the design and it will stitch first as listed in the object pane. 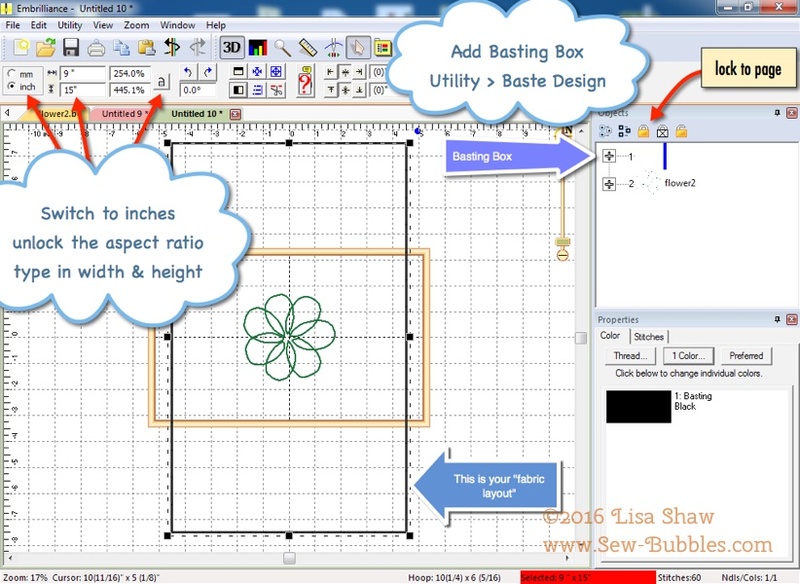 Now let’s resize this box so that we can use it as a guide for where the embroidery designs need to be placed. First, switch to inches if you are not already there and UNLOCK the aspect ratio in the top menu bar on the left. Now, type in the size of the embroidered area – I determined that it would be 9” x 15” – and hit ENTER on your keyboard and your basting box should resize as shown. NOTE: use the zoom slider in the upper right of the design page to zoom out. NOTE: so that we don’t accidentally move the basting box in the design page, click on the Lock Object to page button as shown at the top of the object pane on the right. Be sure that the only item you have selected when you lock is the basting box. So now we can see our hoop and the fabric area. Visually we can easily see that it will take 3 hoopings. I always try to start in the middle and work my way out when I am designing and stitching an all-over fabric layout such as this. 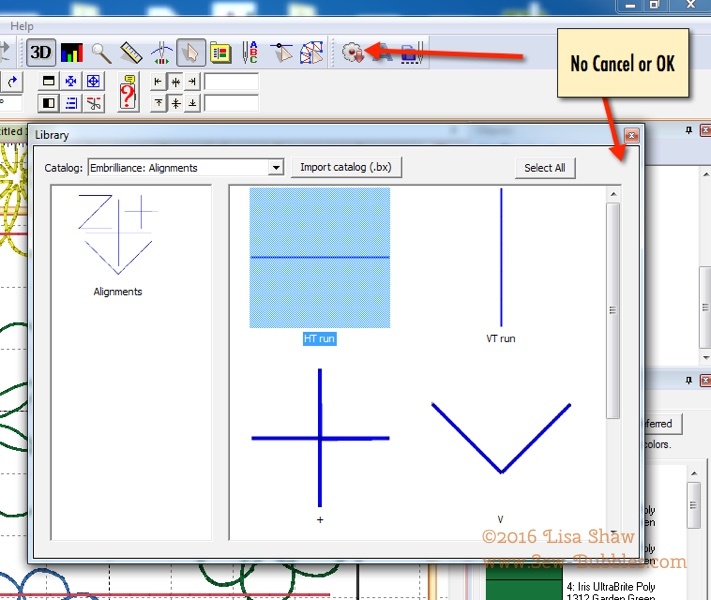 Here is a short video clip that shows how I create the layout by simply copy and pasting designs and moving them to fit inside the fabric border that I have created by way of the basting box. Once you have the general design layout created, you can always make further adjustments by ungrouping and moving the objects to where you want them to be to get the look you want. We know that the original group fit the hoop we have selected. Keep this in mind if you choose to move stuff around – each color can be no bigger than the hoop you have chosen. The size of any selection is shown at the bottom of the screen in the status bar to the right of the hoop size. When the design size is RED at the bottom of the screen, this tells you that the overall design size is too big for your machine. We do not care at this point, we are creating a BIG layout and will worry about actual design size later. Now that we have the layout created for the hoop we have selected, its time to add our alignment lines and save our files. I’ve done a couple of blog posts on this topic, so I’m not going to completely repeat myself! Here is the link to the post that has the alignment line library you can add as well as other supplemental information – and more pictures/examples! Choose the Horizontal Alignment and click OK to merge it into the current design. Whenever you merge designs into the open design page, they are placed at the end of the design in the Object Pane. They don’t need to stay there! You can place them anywhere you want in the Object pane – since they are the last thing that you have added, they are set up to stitch last by default. Before we move this line in the stitching order, let’s go to the Design page and put the alignment lines where they need to be. These lines are what will help you line up the sections when you get to the machine – if you have no idea what I’m talking about, please visit the blog link above for some detailed background information. In short, when you add alignment lines to a design, they ensure that the designs are going to stitch exactly where you expect them to. Think of this as registration marks when printing out a pattern or template that is too big for one sheet of paper. The printer will put these little marks on each sheet of paper – when you line up the marks and tape them together you get the big pattern. Alignment lines work on the same principal. The lines are stitches and are part of the embroidery design. Once you place them in a particular location in the overall design layout, you don’t want to move them. You want to make sure that the line fits or lives in the overlapping parts of each hoop section. I’ve zoomed in (screen capture above) so you can see better. I changed the black basting box to white so its not adding to the visual confusion. One of the biggest hurdles in using any software is being overwhelmed with information and clutter – zoom, analyze and try to help yourself work on small tasks at one time. I changed the first line to red, used the handles to make it longer, and moved it to the top of the displayed hoop. Because we changed the colors for each design section it is easy to see what is going to stitch in each hoop section. The green is our center hoop, the yellow is the top and the blue is the bottom. The center overlaps with both the top and the bottom, so we need a line between each of these design sections. This line has to be placed in such a way so that it will stitch with both the center hoop contents and the contents for the hoop it overlaps. Once the lines are placed correctly you do NOT want to move them on the design page! BE VERY CAREFUL in how you do the next steps. Now we need to save out the three files – I’m going to call them Center, Top and Bottom and when I stitch them they will be stitched in that order. The lines in Top and Bottom need to stitch first at the machine. So let’s look at the design we saved as Center. Checking the stitching order in the Object pane of the Center design – the lines are in the right spot so good to go. If we look at the Top and Bottom files – they both have the lines as the final object to stitch. So we simply need to right click on this las object, choose Move First and re-save the file. DO NOT MOVE ANYTHING in the Design page! We are just changing the stitching order – everything else stays the same. The lines are “locked” to their position in each hoop section relevant to the original large layout. If you line up the lines, it is mathematically impossible for the designs to not line up with each other. Don’t believe me? Print actual size templates of all three designs and line up the lines. You can see here, I printed the center design on white paper and the Top and bottom on vellum so you can see thru. 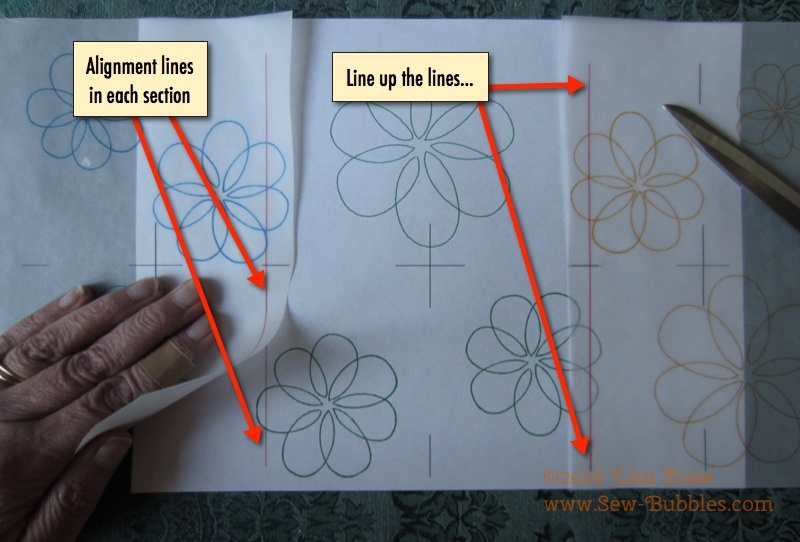 If you can line up the paper templates, you will line up the embroidery designs! Now we are ready to go to the machine with our three files and stitch them out Center, Top and Bottom lining up the lines as we go. And YES if you checked out the link to the earlier blog post you will see an example of the stitching process with tips and tricks. And YES, in the Craftsy class Big Embroidery with a Small Hoop we start with easy projects and move up to the Grand Finale design which is 6 hoopings! So after all has been stitched on our two cover pieces, we trim them down to size and treat the embroidered fabric as…fabric! When stitching an all over design such as this, I will use an adhesive tearaway and take the time to remove the excess stabilizer before construction. You may also use an adhesive wash-away which is less crunchy. I do choose to remove all stabilizer prior to construction, so I will stitch, rinse, dry, press from backside, and then trim to the correct size for the pattern. Here is the finished Bendy – so cute and I told you it was a very forgiving pattern so PERFECT for trying out a new embroidery technique such as creating an all-over embroidered design!